This is an extremely interesting object formed by a super hot, short lived, massive Wolf-Rayet star. At a point in the past this rare type star swelled to a red giant stage and ejected it outer layers into space. As the star then contracted because of the crushing force of gravity, intense radiation from the exposed, hot inner layers began stripping gas away from the star at speeds in excess of 3.5 million miles per hour. 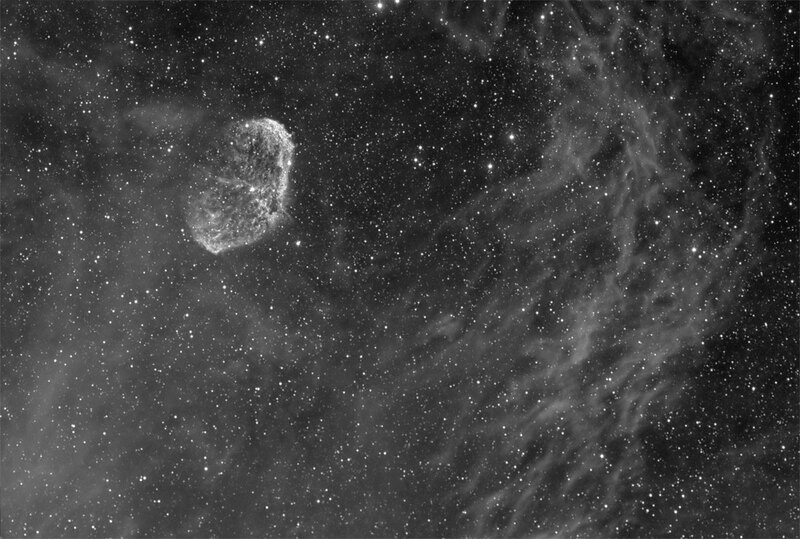 When these high speed stellar winds caught up to and collided with the red giant ejecta, the shell of the Crescent Nebula was born in the resulting shock wave. The Wolf-Rayet star responsible for this creating this beautiful object is the bright star near the center of the nebula and is designated as HD 192163. It is theorized that HD 192163 will likely explode as a supernova sometime in the future. Lying approximately 4700 light years from earth, the Crescent Nebula is about 16 light years wide and 25 light years long.